The geographical backbone of Ladakh, the Inuds Valley, particularly from Upshi down to Khalatse, is also the region's histocric heartland. All the major sites connected with the former kingdom's dynastic history are here, starting with Leh, the capital city since the early 17th century when Sengge Namgyal built its nine-storey palace. A few kilometres up the Indus is Shey, the most ancient capital, with its palace and temples, their vibrantly coloured murals cleaned and restored in the mid-1980s. Down river, Basgo, right on the road and Tingmosgang, a short way up a side-valley, both served as capital cities when the country was temporarily divided into two parts in the 15th century, and both have the remains of forts and temples dating from the period of their brief glory. Stok, just across the river from Leh, is the village with which the deposed royal family was compensated for the loss of its throne. Its palace houses a museum of artefacts associated with the dynasty, and there is also a small gompa. 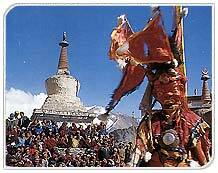 Partly as a result of royal patronage, the central area of Ladakh has the greatest concentration of major gomps. Of the twelve situated on or near the Inuds, the is Lamayuru, believed to have been a sacred site for the pre-Buddhist religion known as Bon. Phiyang, Hemis and Chemrey were all founded under the direct partonage of members of the ruling Namgyal dynasty. Phiyang represents an act of penance by the 16th century King Tashi Namgyal for the violence and treachery by which he reached the throne. 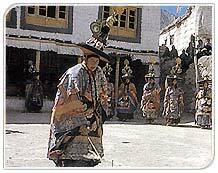 Hemis, together with Hanle near the Tibetan border, was founded at the instance of King Sengge Namgyal, and Chemrey by his widow as a posthumous act of merit for him. Stakna, dating from a slightly earlier period, was endowed by the Namgyal kings at various times. All these belong to the red-hat Kar-gyut-pa sect of Tibetan monasticism. The reformist Ge-lugs-pa (Yellow-hat) sect is also well represented in central Ladakh by Thikse, Likir, Ridzong and Spituk, the last of which hasdaughter houses at Stok, Sabu and Sankar. Ri-dzong, the only gompa which is not as yet approachable by a motorable road, is situated a few kilometres up a side- valley at Uley-Tokpo. It was founded only a century and a quarter ago by a devout layman-turned-lama, with the purpose of giving full expression to the strict monastic rule of the Ge-lugs-pa. While the paintings and images in its temples may, to some extent, lack the aesthetic and antiquaian interest of those inthe older establishments, this gompa nevertheless has an indefinable atmoshpere of peace and dedication which reflects faithfully the inwardness of the Buddhist Way. The smaller but much older Bying-ma-pa and Saskya-pa monastic sects are represented respectively by Tak-thok and Matho gompas. Takthok, at the foot of the Chang-la, incorporates one of the many caves in the Himalaya where the Indian Buddhist apostle Padma-sambhava is said to have rested and meditated on his journey to Tibet. Matho Gompa has a slightly rundown structure, but a vibrant religious community. It is famous for its festival of the oracles which takes place early in the year, usually in the first half of March. But the jewel among central Lakakh's religious sites is Alchi. Abandoned centuries ago as a place of regular worship, it has been lovingly maintained by the monks of Likir, the nearest functioning gompa. Known as Chos-kor, or religious enclave, it comprises five temples, the riches in paintings and images being the Du-khang(assembly hall) and the threestorey Sum-tsek. Its murals, dating from the 11th and 12th centuries, pre-date the Tibetan style of painting that is present in all the other gompas. Some of them are reminiscent of the paintings of the far-off Ajanta Caves and are presumed to be almost the sole survivors (along with some in Phugtal Gompa in Zanskar, and Tabo in Spiti) of the Buddhist style current in Kashmir during the first millennium AD.